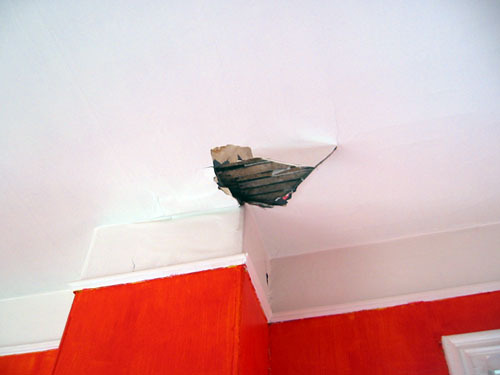 Last night, part of the plaster ceiling in John's room fell to the floor. This is where the old water leak was when we had the chimney and its roof leak. USGS doesn't show any seismic activity last night, so I can only assume that this was a material failure. Fortunately, nobody was under it and it seem to have mostly landed on a plastic-covered wardrobe, but this does put him in the awkward position of having, like, a big hole in his ceiling. I guess I know what I'm doing when I finish painting the front porch.